What is strange about the P90X workout is it does not promote running. Sure you have the Yoga X, Cardio X, and the hardest P90X workout of all in Plyometrics but what happened to good old running. You know running, its that thing you tell somebody they need to do to get into shape. Tell them to go invest in a good pair of running shoes and start hitting the pavement. Over the past couple of years I have really been involved in the whole running scene. I’m happy that I finally did. I was that kid playing sports that had the talent to compete in whatever sport I played but just could not get into good shape so the other kids of less skill would out perform me on the field because I was just out of gas. After my college years I realized that I needed to keep myself in shape because this was the rest of my life and I did not want to turn into a tub-o. I decided to start running. What really got me into running was when I moved from Detroit to Denver. Anybody with sinus problems that has moved from the Great Lakes to the Rocky Mountains knows that breathing is going to become a problem. Running helped me get over the thin air so I could walk normally. I started with 1 mile, then 2, then 3. I actually did the 10k Bolder Boulder. It was the first time I ran 6 miles in one time and I felt proud of it. Fast forward two years and I am back in the Detroit area still running. I decide one day that I am going to run the Detroit Marathon. This was quite a feat for me because the longest I had run before that was the 10k. But I found some good info about training and gave myself about 4 months to do it. Well, I did finish the race in a blazing 4 hours 21 minutes and 1 second. Not bad for a first timer. Never mind the next day how much my knees were killing and reading about how some 72 year old man ran the marathon 5 minutes faster than me. That was a real eye opener seeing somebody who was 45 years older than me do that. I know I went off on a tangent but incorporating running into your P90X is not that hard. I did not run nearly as much as I did pre-P90X as I did during P90X. I was doing at least 15 miles a week before and maybe 4 during. I was concerned that I was going to lose the endurance I worked so hard to build up but I stuck with the P90X plan. Surprisingly my results came back better even with me putting on 10 pounds of muscle with P90X. What I learned is muscle memory is real. Even though my running was less than half of what I did before, the endurance was still there. When I introduced the cardio workouts like Plyometrics, Cardio X, Yoga, and Kenpo it worked on my weaknesses. Over the 90 days those muscles grew stronger and now complimented my stronger ones that I worked on so much before. I remember being hesitant about going for a 5 mile run after completing P90X as it had been four months since I had last done it. My 5 mile time dropped by 2 minutes while carrying around 10 extra pounds of muscle. My legs felt great and did not hurt thanks to the P90X Legs and Back routine. For any of you runners out there who are thinking that P90X will mess up their routine I can personally tell you that it will not. Your running will take a back seat for 3 months but in that time you will be working on muscle groups that need to be worked on to improve your times and limit injuries. Once you are done with the 90 days you will have a revamped body that is strong from head to toe. 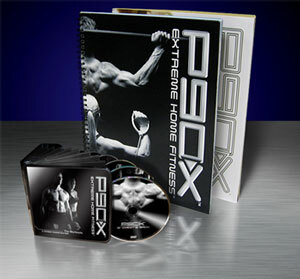 If P90X is more than you are willing to spend then you should at least sign up for a Free Beachbody Account. My husband wants to do P90X, and asked if I wanted to do it with him. I am intrigued, and am excited about using it as a Xtraining/strength training program to compliment my running schedule. I started running about 16 months ago. I’m the girl who failed P.E. in high school- hated it. But running has totally changed my mindset, and given me confidence. I do it for fitness, not necessarily for competition, times, etc. I’ll be running my 4th Marathon in 2 weeks. My goal is to have completed 10 marathons within the next year and a half, so that means I only have 6 to go. When I first began running my fitness level sky-rocketed, and I got in amazing shape, but now I am ready to take it to another level and kick it up yet another notch. So…my question is, shall I run along with doing P90X, and just trade out running for the some of the cardio? My feeling is YES, but since I haven’t done P90X I would love any advice you have to give. Thanks!!!! Our stories sound similar. I use to hate running and some how got into it. It increased my fitness level and I felt great. After finishing the Detroit Marathon I was looking for something new to do. Doing P90X and running was a big time commitment so I just did P90X and ran maybe 2 miles a week. After finishing P90X I was pleasantly surprised to find out that I could run just as fast and as far as before P90X. My legs were in way better shape from all of the leg workouts involved P90X. I would recommend doing P90X on its own and taking a break from running. I have met other people who had the same results as mine and all say that their legs were much stronger and had less injuries. I just took up running again a few weeks ago. I’ve run a half-marathon (in Afghanistan of all places) before, but lately family life and an injured knee have restricted me to 6 miles a week if I’m lucky. I used to do P90X while I was deployed and did not complete the full 90 days. I want to start the program again and still be able to run my 6-8 miles a week. Is this something that you would recommend? Running is like therapy for me, it helps me keep sane when work and home become too much to handle. So it would be hard not keep running while doing P90X. Any advice would be great. Thank you. Half-marathon in Afghanistan huh? Must of been interesting. If you are addicted to running then what you can do is the P90X doubles routine. If you look inside your P90X workout guide book you will see a option for it. Basically you run in the mornings every other day and then do P90X at night. I did not run that much during P90X and was surprised how much stronger my legs did get during the 90 days. When I was done I could run just as far and a little faster than before. Biggest thing was my knees did not hurt as much as the leg workouts strengthened them. I have recently started p90x and I am now on my fourth week ( recovery week ) but i did not start on week one two and three i started on week five six and seven. And now I plan to replace my five six and seven weeks with the one two and three weeks routine. Will this effect my results or mess up the program? You should be fine. Do it in order from now on. I noticed a big difference when I do P90X the way it says to be done. I just started the P90X and I’ve been a runner all my life. I have 2 races coming up within the next month, both 5K’s and it’s been a long time (due to an injury) since I’ve been out running. So I’d like to get back out there and train a few days a week prior to my races. Would you recommend me going out for a jog before or after my P90X workouts? I typically workout between 4-6pm and have to be at work by 6AM, so early morning is out of the questions…Thanks!! Try the P90X Doubles program in the P90X workout guide. I’d run before but not too much so you burn yourself out during the workout. I want to see big results from P90x. Today is day 15, and I’m feeling really good about it, but I do want to lose weight with this, even though the program isn’t built for just weight loss. Would you suggest adding in some running? Which week should I start it? I’m doing the Lean program. Instead of adding running in right now you should do the P90X Classic routine. You will see more results going this route. Do that for 3 weeks and then see how you feel about running. If you must run then do it in the morning and P90X at night. I’m almost 1/3 of the way through my 3rd round of p90x. Before I started P90x I did the standard free weights and circuit weights in the gym mixed in with my cardio routine of running, elliptical, or stairs. I got tired of that same boring routine without seeing the results I wanted, so I ordered P90x. Ditto everything you said for me. My son is 10th grader in High school He is going to be starting the P90X classic program. He has just completed the Cross Country season and has 5 months before the track season to improve his time. He is currently running a 17:30 5K but would like to be running in the 16:30 range starting next August. Would you recommend him running 25 -30 miles a week in addition to the P90X classic program to help attain this goal? Running 25-30 miles a week plus P90X might be too much. I ran the Detroit Marathon 6 months before starting P90X. During P90X I might have ran 2 miles a week because I did not have the 2.5 hours a day to train with work and all. What surprised me at the end of 90 days was my mile time was 30 seconds faster. Most of P90X is cardio related while doing resistance training. Its almost an hour of non stop moving with your body weight and or dumbbells so it builds strength and endurance. Both key to being fit. I would recommend him doing the P90X Doubles Routine where he does P90X and runs only 3 days. Senior year of high school, I did 60 mile weeks and p90x at the same time over the summer, and ended up running a 15:10 at the end of the season for a 5k almost a minute improvement over the year before and wrecked the mile during track season. Just make sure that you don’t do p90x during racing season because you will be too tired to race well. Also to preface, I used to do 85-90 mile weeks during the summer, so p90x actually forced me to decrease my milage by about a third. I think the best advice is to tell your son to take his resting heart rate every morning and if it is higher than usual take the day easy. THis is the best way to avoid injury in a really intense schedule like this. First of all, thank you both very much. I am not as knowledgeable as either of you so I appreciate the advice. Second, @ George…You stated you ran the 60 miles a week plus P90X during the summer. My son has started training now and with living in Wisconsin running outside is just not feasible at times. He basically has November, December, January and February to build his program for the 1 and 2 mile in track and then he will have the additional 90 days over the summer to hit the 60 miles a week plus P90X for cross country. What would you recommend him doing during this time? He is a clydesdale runner so he can handle the over training without the injuries. Any help is appreciated. I’m from florida so its a bit different. Actually in preparation for track my milage is a lot less than for cross country. So I would recommend focusing on shorter faster runs(like 3-5 mile tempo runs) and some 400 -1mile repeats. Days that you can’t go outside, doing tempo runs on a treadmill should be effective. ****make sure he gets his easy days in – you will never get faster if you keep pounding your body to the point that you don’t recover. If he’s ever feeling too sore, a easy 3miler and some stretching will be great. And I would recommend not doing a hard workout the day of Plyometrix X or the day after becasue that is the most taxing day.